Capcom officially announced Onimusha for the Playstation 1 in April 1999 and Japan release date was planned for Winter 1999. 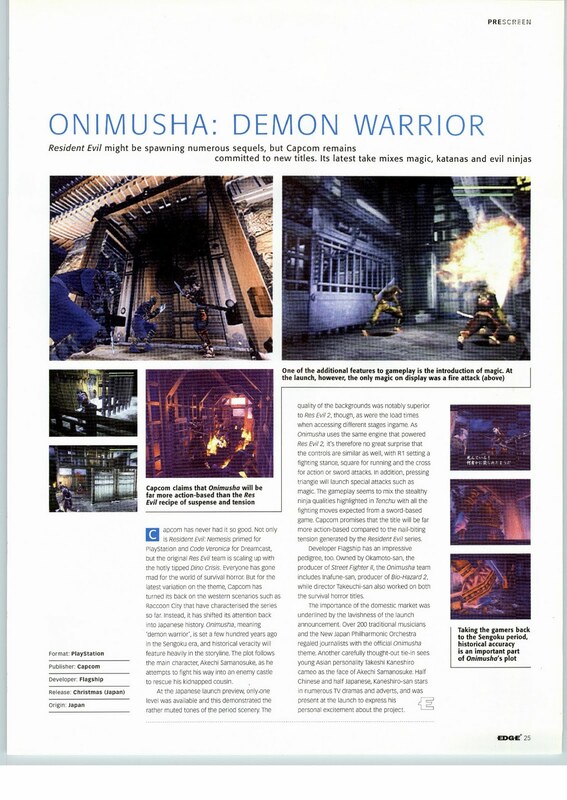 Name of the game was Onimusha: Demon Warrior. Mpx manage to find one page prescreen in EDGE. I haven’t played PS2 Onimusha but according to article, plot is same as in released version. Engine is Resident Evil 2 engine and its stated that in Japanese launch preview only one level was available. According to EDGE release date for game was Christmas (Japan). According to wikipedia: The PSX version of Onimusha was about 50% complete before it was cancelled. Here is link to “rumor” about Onimusha switching to PS2. At Tokyo Game Show 1999. Capcom offical announced that Onimusha became PlayStation 2 videogame. Tentative release date was summer 2000. Here are more info from IGN. Here is something important: Capcom on that TGS released 3 videos of PSX version: Intro CG, Battle montage and Puzzles and battles. I cant find this videos only. According to GIA: Of particular interest is the introduction movie, highlighting some of the most realistic human figures ever seen in computer-generated FMV. Here is information about game from GIA. They is some wrong info that Onimusha started as N64 game which is false. Thanks a lot to mpx for the article! Thanks to Xan124 and mpx for the link to the videos!